Do you know what that Easter Bunny’s favorite food is? Carrots! 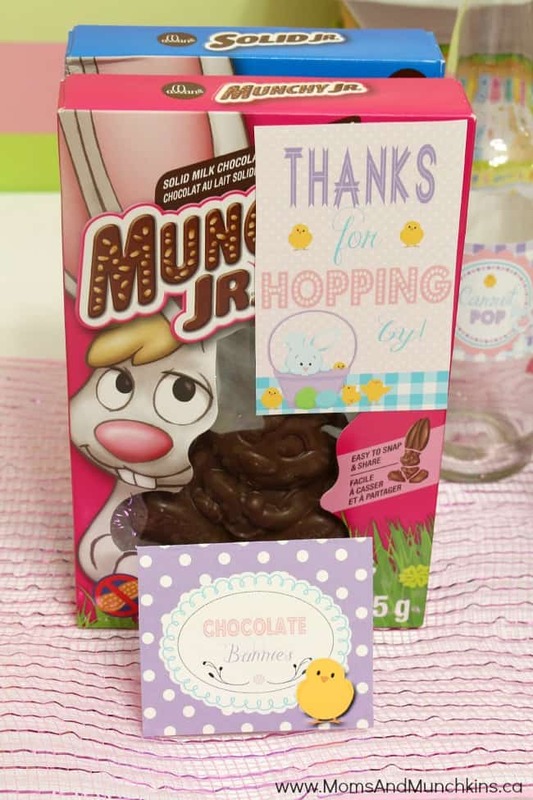 These Hoppy Easter Party ideas are filled with delicious carrot treats, adorable decorations and a carrot scavenger hunt. It’s the perfect Easter party for bunnies of all ages! 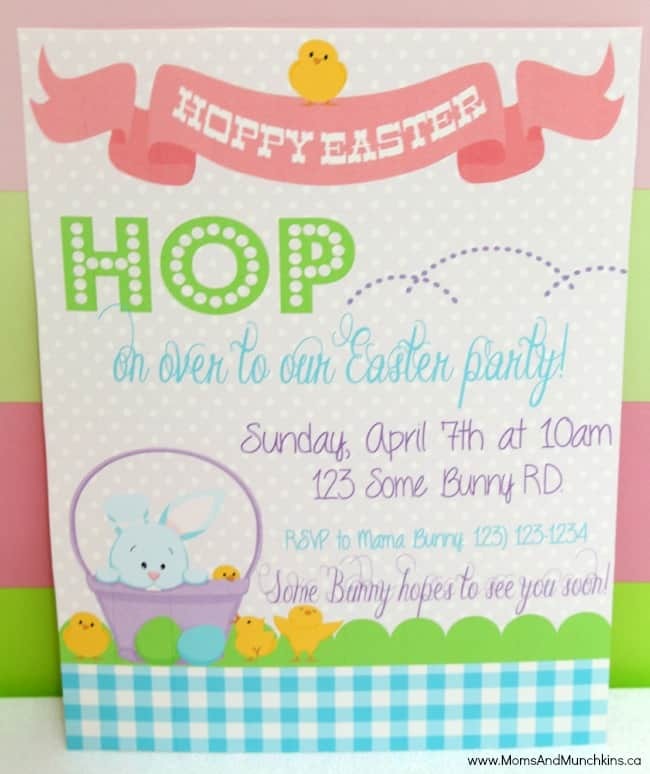 Invite all of the little bunnies to hop on over to your Hoppy Easter Party with this cute printable invitation from Just a Little Sparkle. 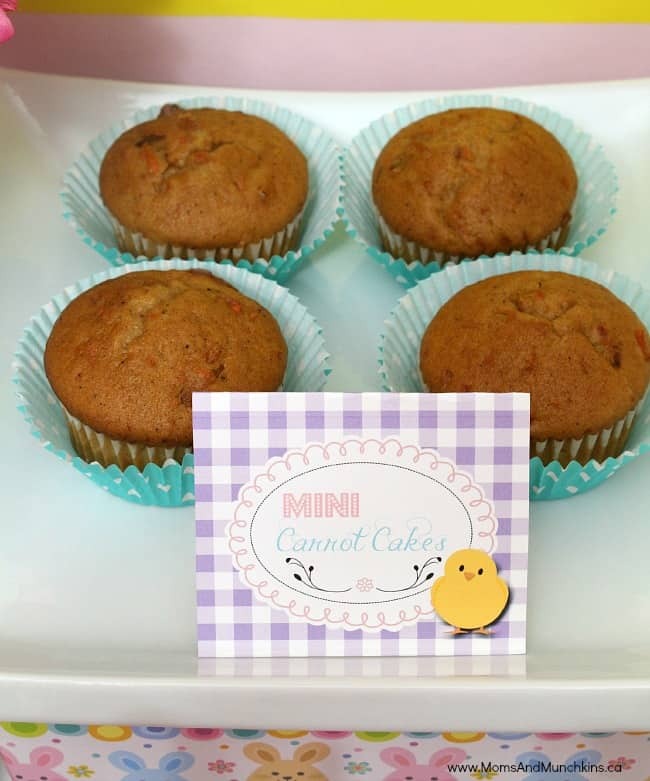 Your envelope can be sealed with a cute Easter Bunny or carrot sticker. For the crafty types, you can place the invitation in an orange envelope with a green tissue paper border across the top (to look like a carrot). 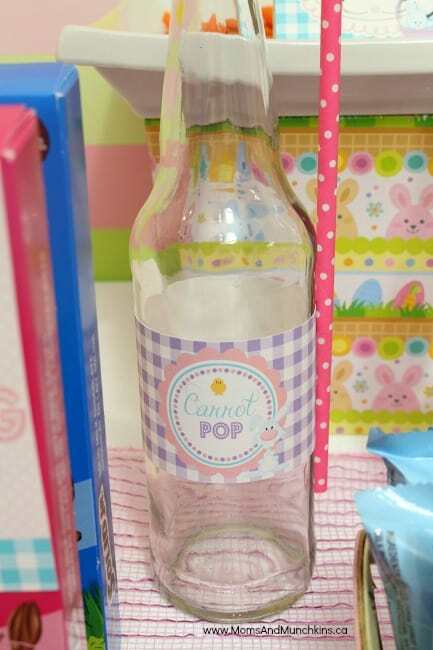 Easter parties are so easy to decorate because of the wide variety of supplies on the shelves during the Easter season. One of my favorite places to shop for inexpensive party supplies is our local dollar store. 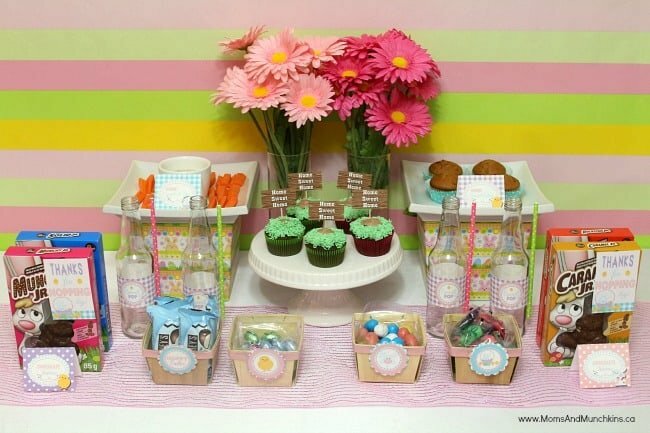 I have a fun collection of cake stands and supplies from past parties that I reused in this party. You may be surprised at how many decorations you already have at home! As guests arrive to the party, invite them to grab a set of bunny ears to wear. The dollar store is also a great place to find a wide variety of Easter Bunny headbands. 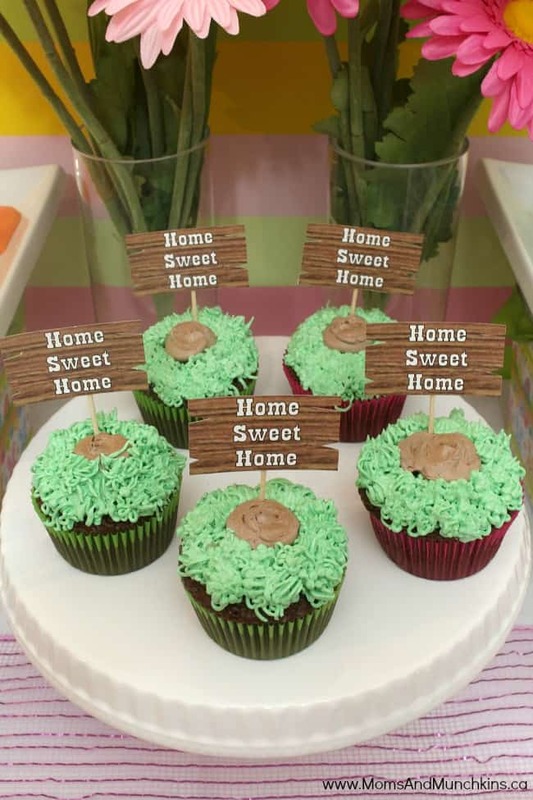 Find out how to make these fun Home Sweet Home Easter Bunny Cupcakes here – they have a hidden bunny inside! We have the free printable cupcake topper for you as well. 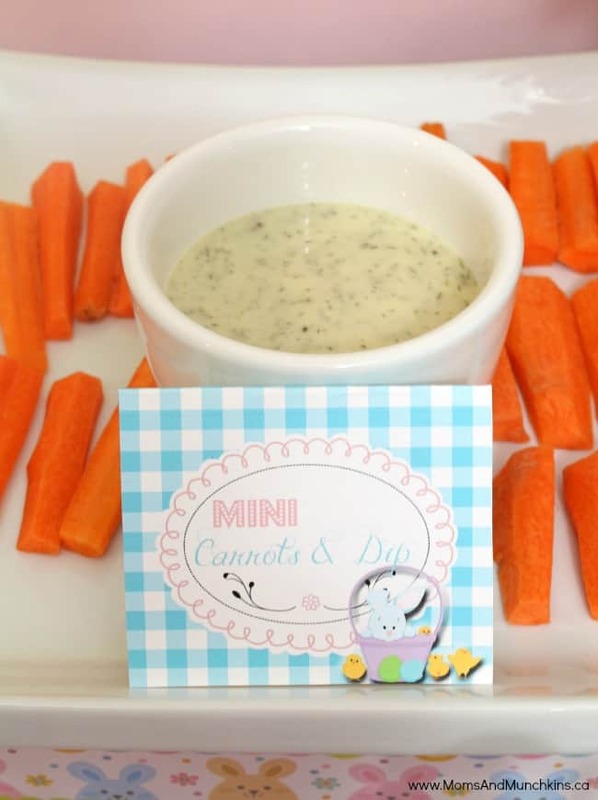 Carrot Hunt: A fun twist on the traditional Easter egg hunt is to plan a Carrot Hunt! I found plastic carrot “eggs” at our local dollar and I knew they’d be perfect for this game! 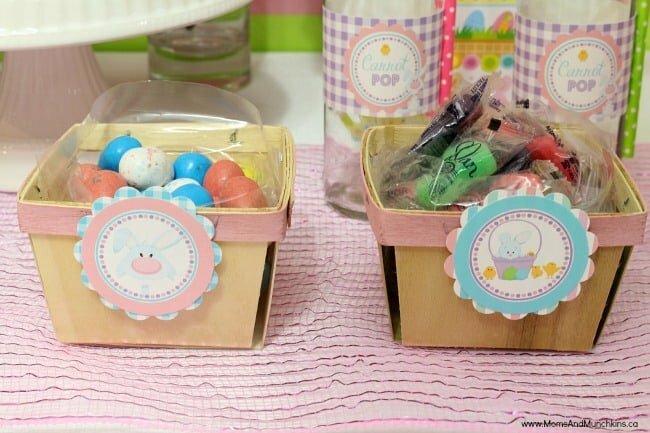 You can fill these with stickers, candies, temporary tattoos, bouncy balls, bunny droppings (chocolate eggs) and other small treats. These can then be hidden around your house and yard. 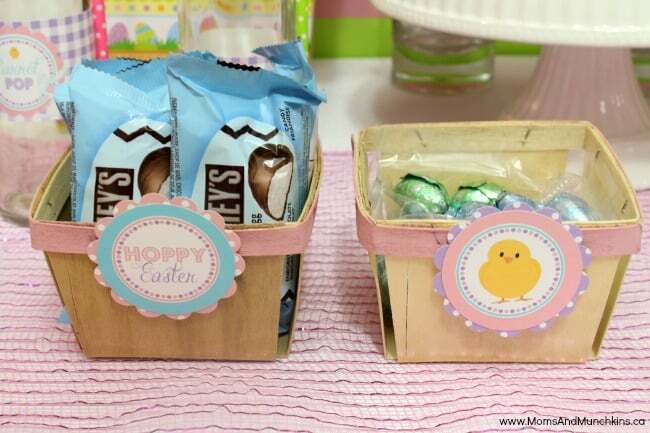 Guests can be given little Easter baskets to fill with the goodies they find. Easter Bunny Hide & Seek: A simple stuffed bunny can be used in a game of Hide & Seek. Simply hide the bunny somewhere around your house or yard and asks guest to try to find him. The first person to find him can be the lucky person that gets to take him home. Hopscotch: If there’s one thing the Easter Bunny loves as much as carrots it’s a fun game of hopscotch! Using sidewalk chalk, have the little guests create a fun hopscotch pattern outside to play on. Stay updated on the latest ideas for holiday fun by following us on Facebook, Twitter, Pinterest and Bloglovin’. *Disclosure: Just a Little Sparkle provided this printable set to Moms & Munchkins free of charge. All opinions expressed here are my own. Cheryl, you amaze me with your creativity for parties. You come up with the cutest ideas! 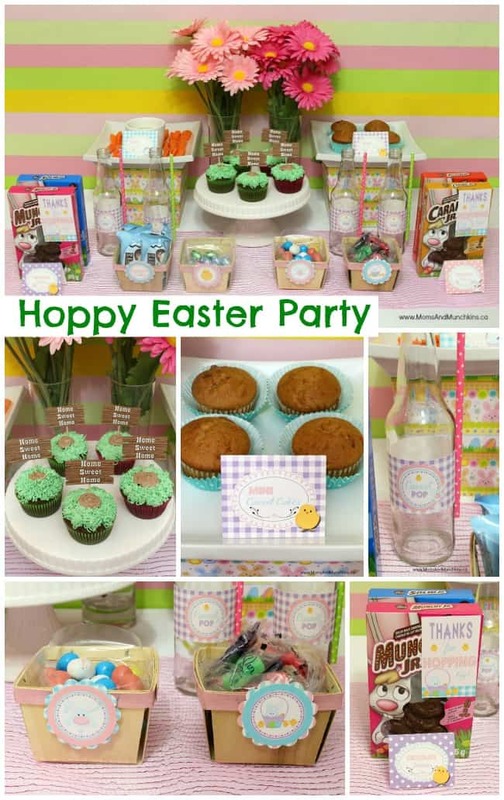 Love this Easter party and all the ideas you came up with. Thanks so much for linking it up at the Real Family Fun link party.